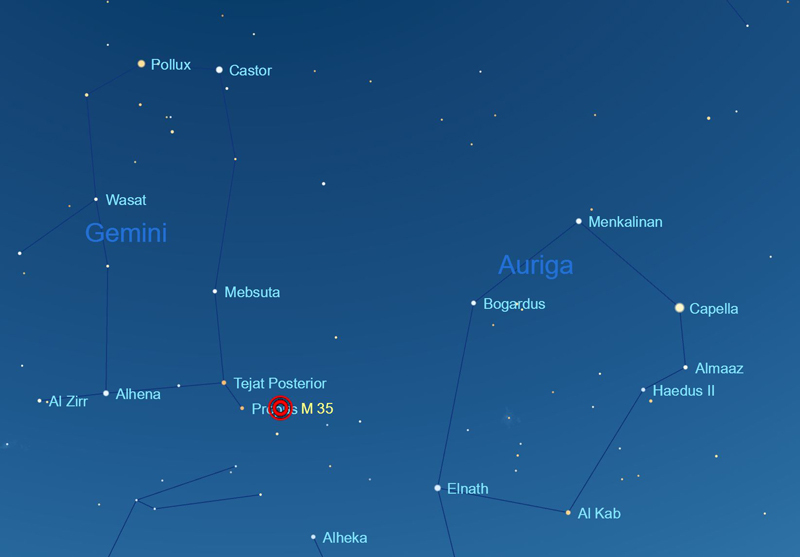 Figure 1 – The constellation Gemini showing the objects on this tour: Castor, Wasat, and M35. While it's cataloged as α (alpha) Geminorum, Castor (mag 1.62) is just a little fainter than next-door β (beta) Geminorum, or Pollux (mag 1.14). If you can't remember which star is which, remember "Castor is closest to Capella", the brightest star in Auriga. Castor is also a whitish star while Pollux is yellow-orange. In a small telescope at 80x or so, Castor resolves into two bright stars. The A component has a magnitude of about 1.8 and lies some 4" from the 3rd magnitude B component. These stars take some 400 years to revolve around each other in an elliptical orbit. In 100 years from now, the stars will increase their apparent separation to about 6". At their closest, the two stars are only 1.8" apart. Castor A and B are blue-white A-type stars only 45 light-years away. There is a third star in the Castor system: to the south, you'll see a much fainter red-orange 9th magnitude companion in your field of view about 71" away from Castor A. This third (or "C") component is a small M-type star that revolves around the two primary stars every 10,000 years or so. Each of the three stars in the Castor system is itself a double star... so there are six stars in all, but the close companions of Castor A, B, and C are too close to resolve directly in any telescope. Follow Pollux southwest to υ (upsilon) Gem and onto the star δ Gem, also called Wasat, which means "middle" in Arabic. Wasat is a challenging double star for a 3 or 4-inch scope. The pair is split by 5.6", but the brightness differential is substantial: the primary is magnitude 3.6 and the secondary is magnitude 8.2, which is a factor of more than 80x. The brighter is clearly whitish-yellow, while the secondary is red or even purple in hue. A fun fact: the former planet Pluto was first discovered near Wasat by astronomer Clyde Tombaugh on photographic plates he took in January 1930 at Lowell Observatory. 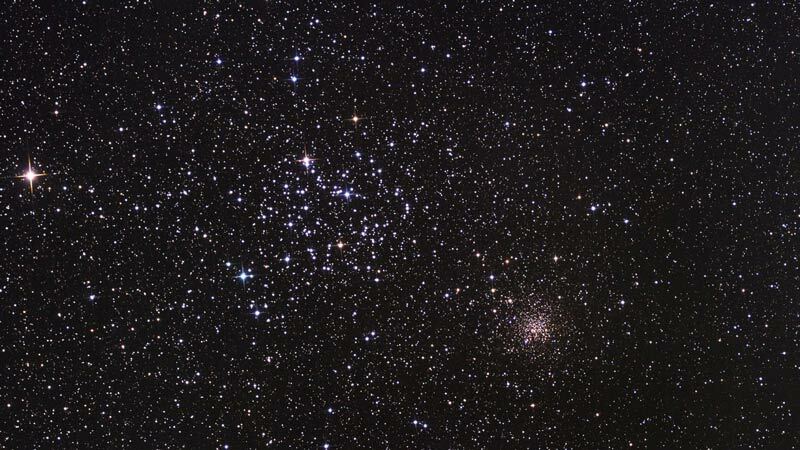 Figure 2 - Star clusters M35 and NGC 2158 (lower right). Credit: Marc Van Norden via Flickr. Perhaps the greatest of all the 'gems' of Gemini, the open star cluster Messier 35 ranks as one of the most beautiful of its kind in the heavens. The star cluster is just visible to the naked eye in clear dark sky, and at magnitude 5.1 it appears quite faint because it's light is spread out over an area of sky as large as the full Moon. To find the cluster, look just a couple degrees northwest of the star eta Geminorum, one of the feet of the constellation Gemini. In binoculars, M35 looks like a tiny patch of frosted silver, with a few stars visible at most. In a 3-4-inch telescope, upon careful examination, you'll see 40-50 stars. In an 8-10-inch scope, the view of this cluster is awesome, with bright blue and white stars blazing in the field of view, along with a few red giants that have evolved off the main sequence. Even a modest scope reveals curved strands of stars twisting about a sparse central region, like bursting fireworks on a dark summer night. Unlike many star clusters, M35 has no central condensation. In fact, many observers see an absence of stars or a "hole" near the center of the cluster, which, with a little imagination, gives it the appearance of a sparkling sugar donut. M35 is some 2,800 light years away and spans a diameter of 30 light years. Like most open clusters, M35 is quite young: it formed only 50 million years ago. Within the same field of view of M35, about 0.5 degrees to the southwest, lies the much smaller open cluster NGC 2158. It's about the same size as M35 in real terms, but it appears smaller because it's 6x farther away. In a 3-inch to 6-inch scope, you'll need dark sky and averted vision to spot this tiny cluster. Brian Ventrudo is a writer, scientist, and astronomy educator. He received his first telescope at the age of 5 and completed his first university course in astronomy at the age of 12, eventually receiving a master's degree in the subject. He also holds a Ph.D. in engineering physics from McMaster University. During a twenty-year scientific career, he developed laser systems to detect molecules found in interstellar space and planetary atmospheres, and leveraged his expertise to create laser technology for optical communications networks. Since 2008, Brian has taught astronomy to tens of thousands of stargazers through his websites OneMinuteAstronomer.com and CosmicPursuits.com. Mak the Night and Orion25 like this.